This is a continuation of a discussion and challenge that I threw down on myself that started on the French Laundry Cookbook thread. Rather than hijacking that thread I thought I would start a new thread here. Last week, I was inspired by the Cookbook You've Never Used thread to pull out my French Laundry Cookbook. My wife reminded me that I've never actually made any of these recipes, so I've committed myself to making a full five course (soup, appetizer, entree, cheese course and dessert) meal from the book. My hope is to document my progress and post some pictures here of the food in process and the final results. • I want to see if the book is really as difficult to use as many have said it is (I'm not doubting that it is, but I want to try it out anyway). • I'd like to give my cooking skills a good test - I feel like I've been coasting lately, and want to give myself a challenge. • I'd like to integrate some of the lessons in the eGci Plating Course into my cooking. In looking back at my posts on the Dinner thread - most of my dinners are of the one-bowl variety - pastas, asian stiry-frys, stews, soups, salads. This is the way I prefer to eat, but it tends to be of the "plop it in the bowl" style of plating. • And not least, I want to get an appreciation of just how much work does go into a meal like this. I've eaten at both TFL and Per Se (in addition to many other similar places) and this sort of task might help me get more out of those meals and not take them for granted. (Yeah, I know how jaded that sounds - see, I need help here). Besides, I'm not a total dope. I'm going to make things easy on myself. I'm only cooking for two (me and my patient, grateful wife, jenrus) and I'm not going to have the pressure to have everything come out at a perfect interval, although I am going to try. I'm trying to pick "relatively" easy recipes that can be prepared over the course of a few days. Several users were good enough to give me some feedback on the original thread that I am taking to heart and making part of my planning - the current plans call for dinner to be Saturday, April 16, (although a possible change in plans could push this back to Sunday). I've started doing some of my "sourcing" - I call it going to the grocery store(s). • I couldn't find beet juice at either store so my plan for now is to buy extra beets and juice them myself as zeitoun suggested. We'll see about the beet powder (which Busboy referred to as ‘fairy dust’). I was thinking about skipping this step, but it's too early to be copping out at this point. • Neither store has had yellow beets, so this may end up being a monochromatic salad, but it shouldn't lose much in the translation. • No Morel mushrooms yet either - if they aren't enough in season to actually find any, I guess I have two options - 1) use rehydrated dried morels or 2) use some other mushrooom. Anyone have any thoughts on this? • My one short cut I am resigning myself to is that I am probably to use a veal/duck demi glace from d'Artangan as the basis for my "quick" duck sauce. Only Keller could call a sauce that starts with two separate stocks and four rounds of reducing and deglazing a "quick" sauce. I know he likes to use a lot of "quotation marks" in his menus, but this is just overkill. Besides, I'm doubting that I am going to find duck bones soon enough. Over the next few evenings, I am going to start some of the early preparations - like making beet juice and fairy dust. I'll start posting pics as I do. I hope a few people enjoy following along (actually my first goal is for me to enjoy this, and then my wife who has to eat the dinner, but you are all a close third). Please give me as much feedback, encouragement or discouragement as you’d like. Sounds like you're making the Roulade of Pekin Duck Breast as one of the courses. Let me know how that goes...I was going to try that one next (partially because I need to learn more about making stocks). As far as sourcing hard-to-find ingredients, have you ever tried asking someone at a restaurant to order something for you through one of their purveyors? I'm not sure if this is a common practice, but my restaurant has done it for a couple of people before. The owner has no problem with it as long as they're willing to pay for it. Hell, that's how I get all of my odd ingredients for home cooking (of course it helps that I work there). Regarding the beet juice/powder ingredients - isn't it the same to use purchased beet powder and make juice from some of it and use the rest as just powder? Bravo! I'm impressed. I can't imagine using a cookbook like TFLC for anything other than eye candy. Will be checking back for photos, frustrations and - I hope - victories. We have made the beet juice for the poached lobster. Or first thought was to buy beets at whole foods and take them over to the jucie bar and tell them we want beet juice, but they declined. You may have a more responsive health food store out your way. What we ended up doing was peeling and pureeing beets, as finely as possible, and then cooking them in water, as though you were making a beet stock, and then straining. Don't ask me why we went at it this way, and I have no idea what TK's final product looks like, but the results were spectaular: a deep ruby syrup with an extraordinary taste, clear and rich. If you find an easier way, let us know, but I offer that up if nothing else occurs. I'm sure you can do it the day before. I'm definately going to be following along on this Bill, I have just broken out Bouchon and plan to cook from it next week. Depending on how that goes I may attempt FL. I'll be learning from you!! The French Laundry is a nice cookbook, that is not only made to look at but also to cook from. Some things are of course way too complicated or long to make but if you look carefully, several things can easily be made at home (I must admit however that I would not have the courage to make a 5 course meal from it!!!! I do admire bilrus' courage..). Among other things, the crab salad with cucumber jelly, the 'ceasar' salad, several of the fish or cheese dishes are within most cooks reaches. Do try them! Sounds like you're making the Roulade of Pekin Duck Breast as one of the courses. Sorry, I forgot to copy my menu over from the other thread. As I mentioned, I am trying dishes that look challenging, but not too challenging. I did try to pick dishes I'd want to order if I was in the restaurant and tried to pick fairly "Spring-y" dishes, too. Tonight I started a few of the tasks that could be done in advance. Things started well, but I've had one slight problem. 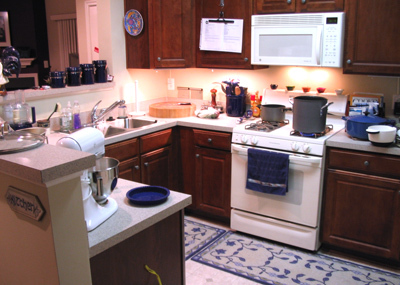 First the setting: this is my kitchen - not very big - probably 8 x 12, but I do have a pretty good amount of counter space. As they say on MTV Cribs when they enter the bedroom - "This is where the Magic happens." 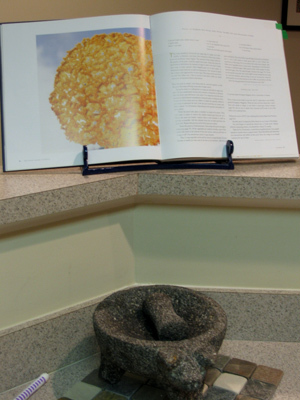 And here is the cookbook in its usual spot, right above my molcajete. But this week it's more than a decoration. I made the vegetable stock for the pea soup - seems pretty standard, although I've never used fennel in a stock before and this is the first recipe I've read that has you sauté the vegetable before adding the water. Here it is going through the chinois I will be using so many times before Saturday. This is going in the freezer tonight. I whipped up the Honeyed Mascarpone Cream, mainly because I wanted to taste it. 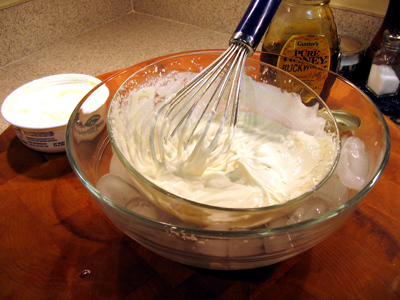 I have to admit that I did cheat (don't tell) and use the whisk attachment on my stick blender. 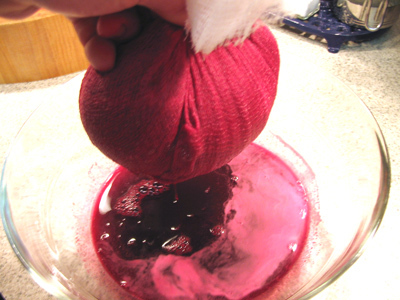 I pureed a bunch of beets with about a cup of water to produce both the juice for the vinaigrette and the pulp for the beet powder. My hands appear that they are going to be red for several days. But so far, so good. I decided to reduce the juice to make it a little thicker and more flavorful. I misread the recipe and had the microwave on high instead of low power. Not only did I burn the pulp (the rest went down the disposal) but I appear to have blown something in the microwave as it is not currently working. So, after day one I've gotten a start on several dishes that turned out well and I might have broken one of my major appliances. We'll see what day two brings tomorrow. 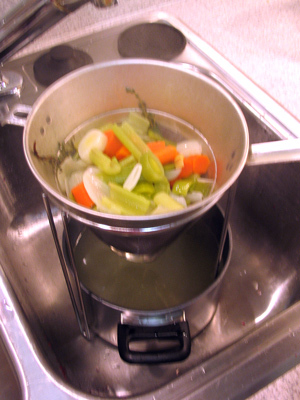 Freeze the vegetable stock as it goes downhill quick. (But lasts well frozen). The stock is going in the freezer in a few minutes, along with several others I've made over the last few months (I'm a big soup fan). As a matter of fact I think a little of my IRS refund is going to go towards buying a refigerator/freezer for the garage so I can always have lots of frozen stock around. As for the peas, neither Wegman's or Whole Foods had the peas in the pods, but Wegmans did have some nice looking packages of fresh baby peas. I'll keep looking and depending on my schedule I am going to try to hit the Arlington (Virginia) farmers market on Saturday morning. Maybe the mushroom lady will be there and I could score some fresh morels, too. If not, the Wegman's peas might be the best bet. BTW - the microwave is still f'ed up. I guess I'll need to call a repairman tomorrow. Or maybe more of that refund is going to need to go towards a new one. Good thing I'm getting a big one this year. I wonder what the people at the office are going to say when I bring in a new batch of beet pulp and cook it (on low) in the microwave in the kitchen there. I've not seen beet powder either, but maybe I'm just looking in the wrong places. What section or type of store would carry that? I've not tired doing that, but it might be worth a shot. Probably not enough time this time around, but another time. I'm pretty fortunate to have a Wegmans, Whole Foods, Trader Joes and Balducci's within 10 minutes of my home and office, plus a pretty good farmer's market (in season) 15 minutes away, so if I'm willing to pay or drive around I can usually find most things. But this may test that theory. Bill, you can get Beet Powder from several on-line sources, ie Barry Farms, etc. Google will help, many have one- and two-day delivery or you may find one in your area. You're doomed! You'll never make it through this. You'll curse Keller for the rest of your life. Seriously though, great project. Thanks for sharing. I can't even manage to take photos of my everday meals to post. Bon courage! Frozen peas? Commercial beet powder? Bill, ask yourself, WWTD? : What Would Thomas Do? No, I am committed to making my own beet powder. It went from being a nice garnish on my cheese plate to a mission after the fiasco last night. And the peas from Wegman's aren't frozen - they're in the produce section and look pretty fresh. Thomas would Froogle, of course! I've found this source for beet powder, $4.45 or $8.15. Or in bulk for $24.40. 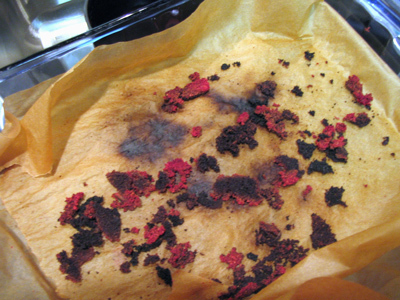 Also gives a recipe for chocolate beet root cake. But now I see you're making your own powder. Go you! Just a quick question about the beet powder and juice. I like your idea about processing the fresh beets and then straining and reducing to a syrup, but then I'm in trouble. I don't and never will own a microwave, so what is an alternative way to dry the residue beet pieces? A 200-degree oven for several hours? And Bill, I forgot to say it before - all the best, I sure your culinary talents will overcome any adversity you may face. Hell, the problems and solutions are half the fun. Thinking more about this - it does bring up a point about the whole process. Like most good chefs, Keller doesn't just randomly pick his courses before knowing not only what he can "source", but also what is exactly at its peak. In other words, he wouldn't (and he has the luxury not to) make, Pea Soup if he doesn't already have some pretty damn good peas at his disposal. When I was looking through the recipes trying to decide what to make, he specifies not only the ingredient, but the specific source or variety of ingredient to use. Alice Waters does this in the Chez Panisse cookbooks too, but her recipes are often pretty simple and all about the specific ingredient. Keller's are much more elaborate, yet he still is very specific about the ingredients, even for something as simple as a fairly tasteless red powder to sprinkle on a plate as a garnish. But at both French Laundry and Per Se, my wife and I were both struck by what we remembered after those meals. We remembered the main ingredients. It wasn't the preparations or accompaniments that stood out - we remembered the beef, the lobster, even the hearts of palm. So from this meal I want the Peas, the Crab, the Duck to be what stands out and what I remember. That will be one way to judge if my project was a success. Thanks. I would assume that would work in a similar manner to the recommended LOW power setting on the microwave - just watch it carefully. It's funny - I don't use the microwave much at home, mainly to heat up a few leftovers or melt butter. But I already feel quite lost without it. Of course it is also my over-stove lighting, my vent hood and my kitchen timer. Hey Bill it all looks like lots of fun! I'm so sorry your microwave conked out. I wonder what could have caused it. Is it covered under any warrantee? About the beet powder, Rich's idea of dehydrating it in the oven might work. Gee I hope you find some peas. If it turns out that you can't find any fresh, are you going to choose another recipe or are you going to make due with the best you can find? I moved into this house three years ago last week. My warranty through the builder was only one year. There is some sort of limited 10 year warranty - probably limited to exclude whatever this problem is, but we'll see - the repairman is coming on Monday. In the meantime it looks like Rich's oven solution is the route to go. I think the fresh peas I know I can get should be pretty good, but I may have a look through the book tonight to see about other options. I liek the idea that this can be a hot or cold soup. That is going to be a game-time decision based on the weather. I wish I had some of those wonderful sources of produce I remember from your foodblogs. Things are a little different here in the US exurbs. BTW - If any amateur (or professional) sommeliers have wine recommendations to go with this menu, I'd be interested in hearing them.